Mumbai’s Kurla Terminus resembled a bustling hive with long queues in front of ticket counters and people all around. It’s the abject opposite of the solitude runners find in the depths of a run. Sabhajeet Yadav has to reach this station and then catch a train to Uttar Pradesh. In between, two independent journalists have sought time for a chat in the chaotic station. Our allotted time shrinks as en route to Kurla Terminus, Sabhajeet is stuck in Monday morning traffic. The man is easy to spot – medium height, broad shoulders, lean build and taut face. You know an athlete when you see one. We head straight for the cafe above the ticket counters and queues, where he sits for the interview. Twenty four hours earlier, Sabhajeet had just completed a full marathon at Vasai-Virar, a township on the northern edge of Mumbai. He finished second in his age category of 55 and above at the Vasai-Virar Mayor’s Marathon (VVMM), running the 42km-distance in 3:25:51. He is a regular podium finisher at races across India, travelling from one place to another to run during India’s marathon season. At the Standard Chartered Mumbai Marathon (SCMM), he bagged top honours in his age category in 2012, 2013, 2014 and 2015. He has been winner in his age category at the Airtel Delhi Half Marathon (ADHM) in 2011, 2012, 2013 and 2014 (please see compilation at end of story for an overview of his performance at various events). 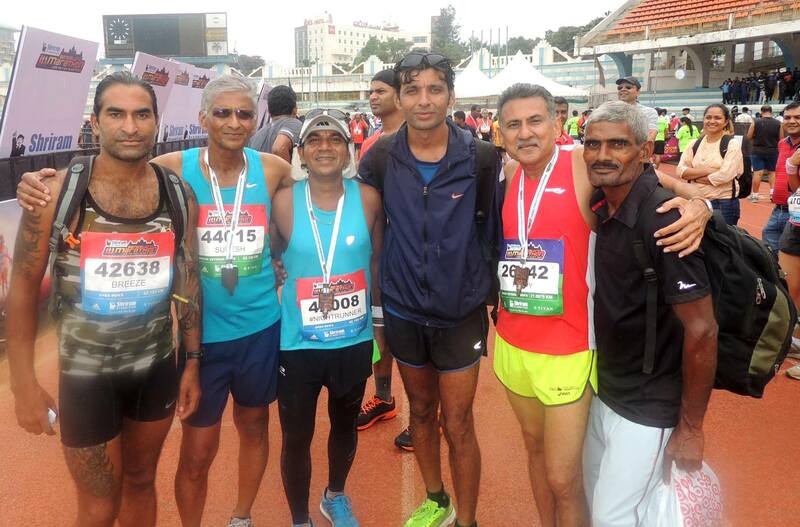 The 2016 SCMM is due in mid-January. But before that Sabhajeet, following a quick visit home will be at two to three other events including the 2015 ADHM. That’s a measure of his running calendar. The 60 year-old now dreams of participating in events overseas, at cities not too far from India’s shores and thereby costing less to access. All this thanks to others, who noticed the farmer from Dabhiya village in Jaunpur, Uttar Pradesh and decided to help him for Sabhajeet is running more for income than achievement or a quest to know oneself. The prize money he gets augments the returns he and family get from farming. The central government’s web page on Jaunpur describes the district’s topography as a mix of flat plain and shallow river valleys. According to Sabhajeet, Dabhiya, where he and family live is “ up and down’’ with a river not far off – the Basuhi river. Crops grown include wheat, rice and sugarcane. Years ago, Sabhajeet had a background in athletics in school. But it wasn’t running. He was into javelin, discus and high jump. If you search the Internet, you will find a Rohit Yadav who placed third in javelin throw at the 13th National Inter District Junior Athletics Meet held in Visakhapatnam in 2015. Rohit is Sabhajeet’s second son; he has a daughter and three sons. His sons are into athletics, none of them are however in running. “ They are into the throwing disciplines, mainly javelin. I want them to do well,’’ Sabhajeet said. He reasoned that long distance running requires a touch of adequate years lived on the planet. You have to be a bit old and mature, he felt. Not to mention, have persistence and patience. These aren’t the strengths of youth. Among reasons Sabhajeet runs seeking podium finishes and prize money is to assist his children in their future in sports. From what we understood, the prize money takes care of family expenses allowing some of the other income streams to be used for the family’s future. Initially, his wife was not happy with his idea of travelling around for running events. But as he started to bring home a fair amount of prize money she learnt to accept his ways. “ With my prize money I was able to get my daughter married. It also helped me construct a house in my village,’’ Sabhajeet said. When he is away running, his sons take care of the family’s farming. Sabhajeet started running seriously roughly six years ago. Between the half and the full, he commenced with the half marathon; then embraced the full marathon as well. He has no problem switching between the two disciplines, which in terms of pace and strategy are as different as chalk and cheese. Initially he had no running shoes. Shoes of any type – old, used, local and gifted – has featured only for the last three years. Practice sessions in Dabhiya are at a local ground. It affords a loop of 200m and whenever he can grab time away from work, the farmer is there, practising. “ I run almost daily. Sometimes for two hours, three hours, even four hours. Apart from farming there is nothing much to do. And there is no concept of a holiday. So I run almost daily,’’ he said. Along the way, he consulted a coach and acquired a few exercises to do that complement his running. As for food – Sabhajeet typically sticks to roti, rice, lentils and vegetables, the standard North Indian fare. Around the time Sabhajeet took to running, Mumbai based-businessman and runner, Bhasker Desai, was in Ladakh to participate in an early edition of the Great Tibetan Marathon. “ I met this poor but cheerful and smiling 17 year-old schoolboy, Tenzing, a free spirited runner who won the full marathon race way ahead of competition. He was running in cheap worn out Bata canvas shoes and his race apparel that day, was his school uniform,’’ Bhasker recalled. One of Bhasker’s friends, who was with him, suggested that they sponsor Tenzing for the upcoming ADHM in Delhi. “ It felt nice that we could support a talented runner to fly Leh-Delhi,’’ Bhasker wrote in by email. With help from still others, they took care of the travel and stay in Delhi for Tenzing and his school sports coach. The Tenzing episode sparked a thought – why not support some older runners who are talented but constrained by lack of resources and wish to complement their paltry income with prize money? 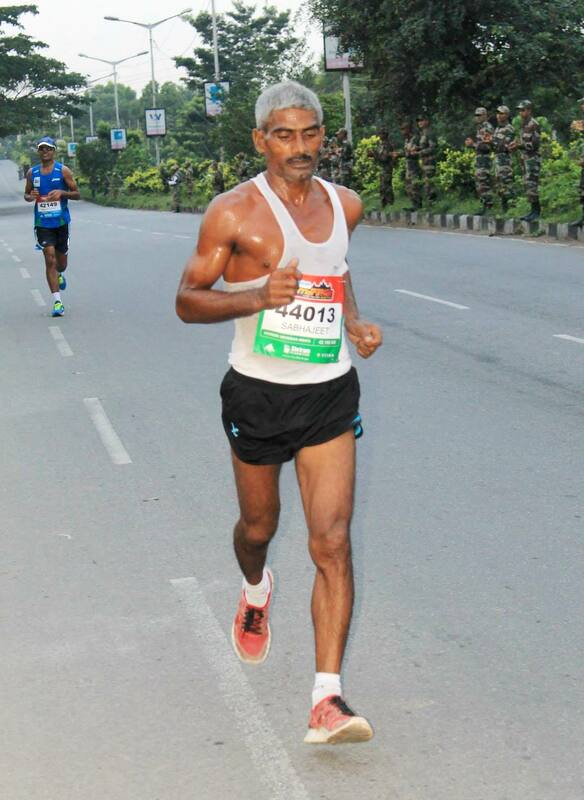 At the 2012 ADHM, Bhasker followed up on Sabhajeet who had completed the race splendidly despite being 55 years plus. “ That is how our friendship started,’’ Bhasker said (for more on Bhasker Desai please try this link: https://shyamgopan.wordpress.com/2015/04/06/from-zanzibar-to-boston-the-bhasker-desai-story/). When we met him after the 2015 VVMM, Sabhajeet mentioned Bhasker’s support in matters ranging from running shoes to identifying the right events and assisting with the registration process including paying the registration fees. For the farmer from Dabhiya, that meant a lot. But why do people choose to help him? It probably has much to do with his nature. Sabhajeet is remembered in the running circles of Mumbai and Goa for the way in which he evolved a committed approach to sports, in a village, far away from the anyway poor talent-scouting India’s sports apparatus does. “ He hasn’t had a word of professional input from anyone,’’ the well wisher said. Sabhajeet designed his training regimen for running by himself; he designed the training for his sons, the javelin they use for practise is reportedly home-made and at least one news report said the choice of javelin throw for the sons was also because everyone could share the same javelin. Urban running is notorious for the corporate-inspired fussing over every tiny detail to improve performance. Dietary inputs from overseas; costly shoes, energy gels, gadgets to measure athletic performance, exotic workouts – the list is long. In comparison, Sabhajeet’s ecosystem is frugal. A runner in Goa recalled how Sabhajeet arrived for the local marathon by long distance train with food his wife had made and packed for him. Ahead of race, he stuck to his routine and rituals; ate the home cooked food. It was after the race had been run and he had won that he let himself partake in a meal with friends. Such was the focus; a quiet, rural version of the urban spectacle. 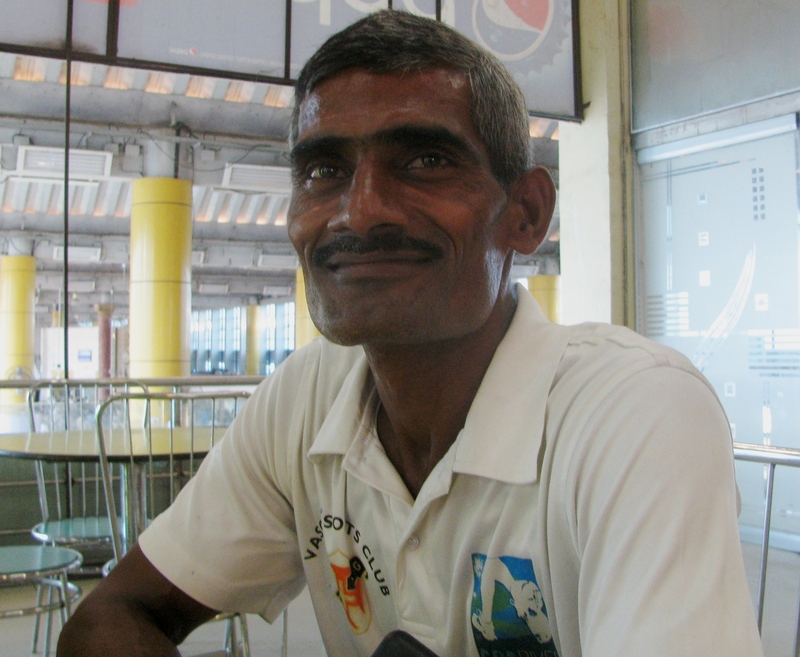 At Kurla Terminus, he was light on his feet, whatever he needed in a small bag. 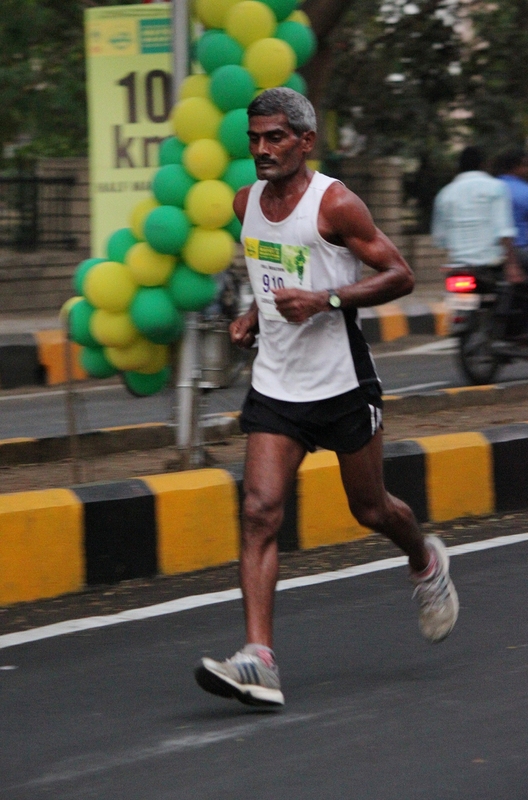 In January 2015, Sabhajeet had reached Mumbai for the annual SCMM with a badly pulled calf muscle. He was limping. “ We took him to a physiotherapist. But what can you do on the eve of a race? He nevertheless went on to win in his category. He is clear about that – he has to run, he has to win,’’ the earlier mentioned well wisher said. In an article in The Times of India, after the 2014 SCMM, V. Anand pointed out that in 2012 and 2013 Sabhajeet – a winner in both years – had slept on the concourse at Mumbai’s CST railway station as he could not afford a hotel room. In 2014, after this was brought to their attention, the organizers provided him accommodation. Those who know him believe a season of running pays Sabhajeet more than he can manage in a year of farming. Over the years, with debts repaid and house built, he has begun shedding some of the earlier desperation and started to enjoy his running. “ It is good to see that,’’ one of his supporters said. According to Sabhajeet he is still the only one regularly running in Dabhiya. Nobody else has taken to the sport despite example at hand of one among them travelling around and earning podium finishes. Do they know of his achievements? “ Yes they do. Once in a while, my name appears in the newspaper and they get to know,’’ Sabhajeet said. In the early days of his running, things weren’t so. The sight of him practising was amusement for others. With victories, an element of respect has emerged. Among things he must now attend to is getting a passport. He doesn’t have one yet and his aspirations include running overseas. We are now terribly close to the assigned time of departure of Sabhajeet’s train. The conversation is wound up. A final photo is taken. Interestingly, it is we who keep reminding Sabhajeet that his train will leave shortly. He is lost in talk about running. The subject evidently engages him. As we descend the stairs to the ticket counters, the din rises. A handshake, then a namaste and Sabhajeet joins those proceeding to the platform. A few days after our meeting, Sabhajeet won in his age category at the 2015 ADHM.